While we were at the Musee du Louvre in the 1st Arrondissement of Paris, we took these high definition photos showing a statue called Bacchante, which was sculpted by Pierre Alexandre Schoenewerk. This first HD photo shows the statue of Bacchante, and in Roman mythology she was a female follower of Bacchus, who was the God of Wine, yet in Greek mythology these females were called Maenads who followed Dionysus. And because they were meant to be wild women that engaged in acts of frenzied intoxication, this is why you can see this Bacchante holding a wine container in one hand and a drinking cup in the other, with her smiling as though enjoying herself, probably intoxicated. Here you can see a close of the Bacchante statue, which was produced in marble by Pierre Alexandre Schoenewerk who was born in Paris in 1820 and followed in his fathers footsteps to become a French sculptor studying under David d'Angers. Pierre Alexandre Schoenewerk enjoyed a prolific career receiving many public with no less than seven for the former Palais du Louvre including this statue of Bacchante, yet many of his works can be found in different museums throughout France including the Musee d'Orsay. But unfortunately, his life was not without trauma, as his best friend died after becoming insane, and the same thing happened to his wife, and so distraught from his losses, he committed suicide in 1885. 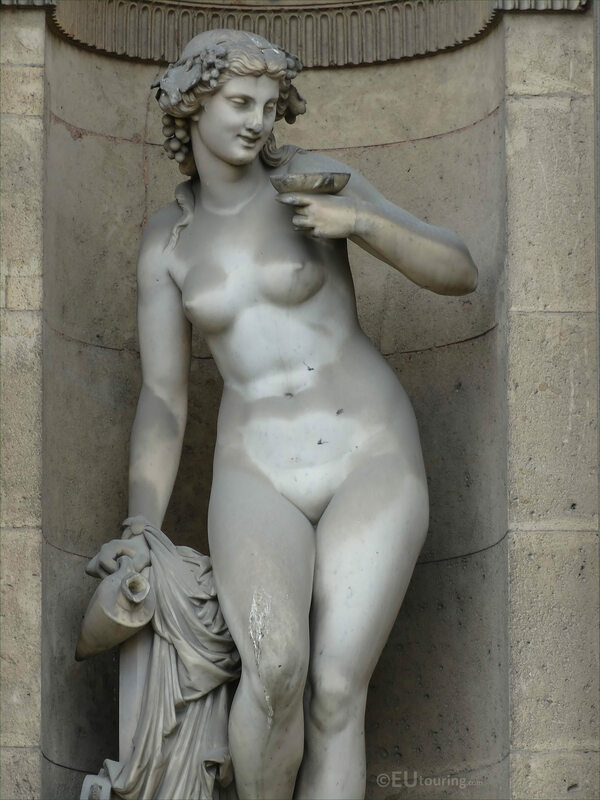 However, here you can see the location of the Bacchante statue located within a niche on the Aile Sud wing of the Louvre Museum, and when you are looking at this facade from the courtyard called the Cour Carree, this is positioned eighth from the left hand side, or third from the right.